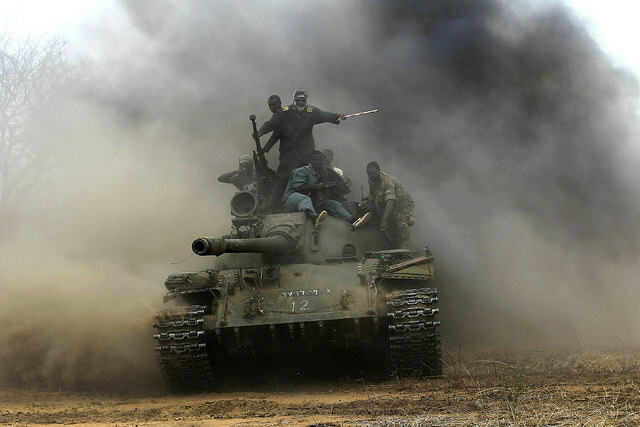 Sudanese Armed Forces (SAF) and Rapid Support Forces (RSF) personnel ride on a T-55 tank. Photo Pancerna / Flickr. The political crisis reached its peak with the execution of Mahmoud Muhammed Taha on 18 January 1985. Taha, a modernist Islamic thinker and the leader of the Republican Brothers, firmly opposed the shari’a laws of Gaafar Numeiri. He was tried and executed for heresy, opposing the application of Islamic law, disturbing public security, and provoking opposition to the government. Anti-government demonstrations began in March 1985 and developed into a general strike in Khartoum and other major cites in early April 1985. The strike was led by the National Alliance, which composed of a group of opposition parties. The general strike paralysed the country while Numeiri was on a visit to the United States. The defense minister, General Abdel Rahman Swar al-Dahab, ousted Numeiri from power, and transferring this to a High Interim Military Council. Freedoms were restored, and legal party activities resumed. In the subsequent elections, Sadig al-Mahdi became prime minister. His administration was characterised by political instability, indecisive leadership, party manipulations resulting in short-lived coalitions, and failure to reach a peaceful settlement in the south. During this period, the National Islamic Front (NIF), led by Hassan al-Turabi, became more influential. They touted shari’a as a solution to the country’s crises. On 30 June 1989, the Revolutionary Command Council for National Salvation, led by Lieutenant General Omar Hasan Ahmad al-Bashir, seized power. The RCC was, in fact, a vehicle for the NIF. While the army was formally and officially in charge, actual decision and policy-making powers were solely in the hands of the NIF Shura (Consultative) Council. Bashir’s military regime took harsh measures against political activists; hundreds were imprisoned and tortured, parties and trade unions were banned, and press freedoms were abrogated. The state apparatus, including the military, underwent a drastic change, and thousands of employees were fired. Elements sympathising with the NIF were promoted to key posts, while more than 400 judges were discharged. Without delay, the new government re-enacted shari’a law in 1991. The new military regime continued the war against the Southern insurgents, which turned into a religious war in defense of Islam against infidels. Young people were recruited to the People’s Defense force to Islamise the people of southern Sudan. The army continued, however, to lose towns to the Sudanese People’s Liberation Army (SPLA), except for Juba, Malakal and Wau – the three major provincial capitals. At the same time, an Arab militia was armed to fight neighbouring Southern tribes. A flood of displaced Southerners streamed to the north or sought sanctuary in Ethiopia and other neighbouring countries. The RCC continued until 1993. Islamist allies of the military suggested a move towards a civilian government rather than maintaining the military exterior. The change was superficial, and the same party elements remained in power. The first presidential and legislative elections since the 1989 coup were held in 1996; Bashir won the presidency and was re-elected again in 2000 and 2010. The ostensible transformation of the government continued with a 1998 referendum, in which a new constitution was overwhelmingly approved. The introduction of multiparty politics in 1999, subject to the party-registration law, seemed to keep power in the hands of the former NIF rather than supporting the transition to democracy. President of Sudan, Omar al Bashir (2009). Photo Abayomi Azikiwe. Historical provinces of southern Sudan prior to secession in 2011. In 1995 Hosni Mubarak, the Egyptian president, accused Sudan of complicity in an attempt to assassinate him in Addis Ababa, and in 1998 the US launched a missile attack on a pharmaceutical plant in Khartoum, alleging that it was making materials for chemical weapons. In 1999 President Bashir dissolved the National Assembly and declared a state of emergency following a power struggle with his mentor, Hassan al-Turabi, the Speaker of the Parliament. There was a division within the ranks of the Islamists. Bashir, as the representative of military wing of the Islamists, now took control from the historical leader, al-Turabi, who established his own party, the People’s Congress, after spending several years in prison. The economy continued to deteriorate, due to isolation and civil war in the south, falling productivity, and increasing inflation. Sudan began to export oil, providing more revenue to the ailing economy. The economic policy of the regime concentrated on providing every possible resource to pay for war—taxes, fees, and other charges. Free trade and privatisation were adopted to the benefit of a newly emerging class of rich Islamists. Oil revenues were not invested in agriculture, industry, or services but went mostly to pay for the war. The Bashir government and the Southern rebels signed the Comprehensive Peace Agreement (CPA) in January 2005, ending the country’s long civil war. The CPA provided for a new constitution and outlined new measures for sharing power, distributing wealth, and providing security. It also allowed for a separate administration for southern Sudan and stipulated that a referendum on independence for that region would be held in six years, which led to the secession of South Sudan in 2011. The conflict in Darfur region began in 2003, when rebels started an armed struggle in protest of the central government’s disregard for that western region. In response, the government armed Arab militias—which came to be known as Janjaweed—to fight the rebels in Darfur. By 2007, the conflict and resulting humanitarian crisis had left hundreds of thousands of people dead and more than two million displaced, internally and externally. In July 2008, an International Criminal Court (ICC) prosecutor alleged that Bashir bore criminal responsibility for the killings in Darfur. The prosecutor accused Bashir of genocide, war crimes, and crimes against humanity and sought a warrant for his arrest – which is still active. Dr. Hassan al Turabi. Photo Fatima Naib. An exhibition of weapons and military hardware on the grounds of the Khalifas Mosque in Omdurman. These were captured during the Darfur rebel attack on the city on 10 May 2011. Photo Andrew Heavens. President Omar Hassan al-Bashir won Sudan’s elections in April 2010, becoming the first leader to be elected while facing an international arrest warrant for crimes against humanity. Photo Benedicte Desrus.